Apparently it's some user level setting as it's no more visible for me ("normal user"), but visible for e.g. rPoXo ("mod/admin"). Last edited by temexter; 2017-09-15 at 16:26..
Never even saw that option . And still don't, that icon doesn't show for me either. I did set the editor to be WYSIWYG in the UserCP, but that didn't change anything for me: https://www.realitymod.com/forum/usercp.php. Something you could check perhaps, just to be sure? The button to change editor mode just has disappeared about two weeks ago. 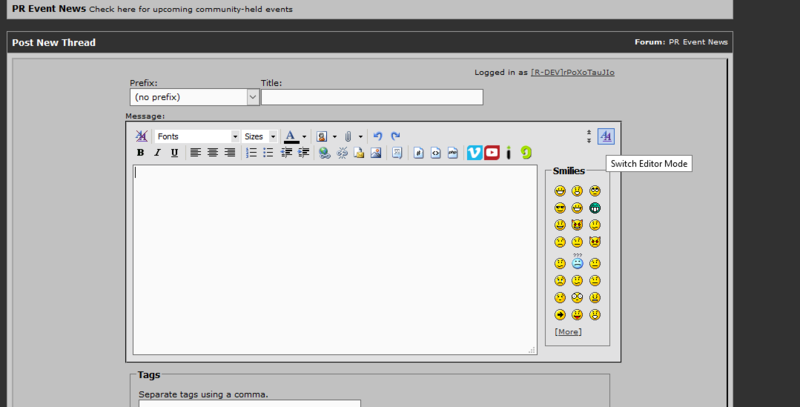 TIL that this forum has a WYSIWYG editor. and yes I can see that button, maybe is limited to contributors usergroup? Bump. Any news about this? I would really appreciate if someone could fix this issue. Like said it's tedious to format event announcements in bbcode.